San Juan National Historic Site, administered by the National Park Service, includes forts, bastions, powder houses, walls and El Cañuelo Fort, also called San Juan de la Cruz--defensive fortifications that once surrounded the old, colonial portion of San Juan. 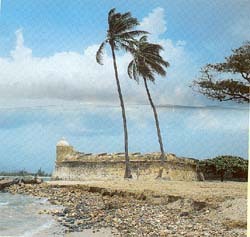 El Cañuelo Fort is located at El Cañuelo Island at the western end of the entrance to San Juan Bay. Sections of the massive sandstone walls, dating to the 1630s, remain; so, too, do the San Cristóbal and San Felipe del Morro forts. San Juan had the first municipal government in the "New World," outside Santo Domingo, as well as the first military presidio in Spanish America. By the 19th century, the old city had become a charming residential and commercial district. The city itself, with its institutional buildings, museums, houses, churches, plazas and commercial buildings, is part of the San Juan Historic Zone which is administered by municipal, State and Federal agencies. In addition to being protected and administered by the National Park Service, the United Nations in 1983 designated San Juan National Historic Site as a World Cultural Heritage Site. The San Juan National Historic Site, administered by the National Parks Service, is on the northwest tip of the small island north of the Bay of San Juan in San Juan, Puerto Rico.Castillo San Cristobal & Castillo San Felipe del Morro are open to the public 9:00am to 6:00pm daily except on Thanksgiving, Christmas Day, and New Year's Day. Call 787-729-6960 or visit the park's website for further information. San Juan National Historic Site has also been documented by the Historic American Buildings Survey. San Juan National Historic Site is the subject of an online-lesson plan produced by Teaching with Historic Places, a National Register program that offers classroom-ready lesson plans on properties listed in the National Register. The lesson is also available in a Spanish version. To learn more, visit the Teaching with Historic Places home page. Other travel itineraries in the National Park Service's ongoing series include many historic destinations that you can visit online or in person. Each Discover Our Shared Heritage itinerary spotlights a different geographic region, community, or theme.